Three years ago, a Kickstarter campaign was launched for a new virtual reality headset known as Oculus Rift. A lot has happened since then, with Facebook purchasing the company for $4 billion in 2014, and the company signing a partnership with Microsoft last summer. Today, Oculus Rift announced that fans can now start pre-ordering the Oculus Rift VR bundle, with a price tag of $599, but those who backed this project for more than $300 to receive a Rift development kit, will receive this headset for free. Take a look at the official statement from the Kickstarter page that was posted yesterday. "On August 1, 2012, we launched a Kickstarter campaign to seed the development of a groundbreaking virtual reality headset - Oculus Rift. Tomorrow, we'll be opening Rift pre-orders on Oculus.com. This is a major milestone on the path to putting great VR in the hands of millions. You're going to experience thrilling adventures in Lucky's Tale and Edge of Nowhere, feel your heart race as you scale mountains in The Climb, and become a rockstar in Rockband VR. You'll create and share something magical in Oculus Medium and participate in the ultimate space dogfighting in EVE: Valkyrie. As one of the early supporters of Oculus, you helped make this revolution happen. And before we open Rift pre-orders to the world, we wanted to share one more special update with you, our Kickstarter community. As a small token of our appreciation for your support, all Kickstarter backers who pledged for a Rift development kit will get a free Kickstarter Edition Oculus Rift! And like all Rift pre-order purchasers, you'll receive a bundled copy of Lucky's Tale and EVE: Valkyrie. To claim your free Rift, fill out the survey you'll receive from Kickstarter before February 1, 2016 and provide a shipping address that is located in one of the 20 countries Rift is launching in. For those who don't live in one of those 20 countries, we're working on an alternative, and you can let us know your preference in the form. You were there at the beginning of our journey -- we couldn't have done it without you. Today marks a new chapter." There will be over 7,000 Kickstarter backers who pledged enough to receive this VR headset for free. The official Oculus Blog reveals that pre-orders will start shipping on March 28 to over 20 countries. 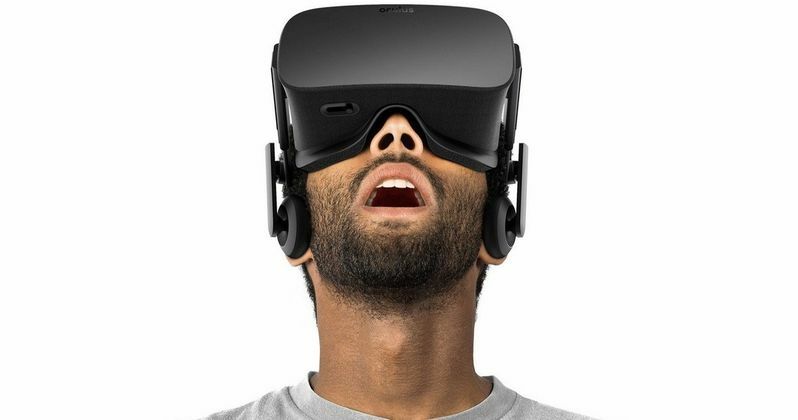 Oculus Rift will also be available to purchase in select retailers starting in April. This package includes the headset with built-in headphones and mic, sensor, an Xbox One controller, the Oculus remote and two games, Lucky's Tale and EVE: Valkyrie. The site also reveals that there will be over 100 games available to play on this virtual reality headset, including Minecraft and over 20 games that will be available exclusively on Oculus Rift. Some of these titles include Rockband VR by Harmonix, Edge of Nowhere by Insomniac, and The Climb by Crytek. If you're thinking about purchasing this VR device, you can check to see if your computer is compatible with the Oculus Rift by downloading the Oculus Compatibility Tool. The company will also be certifying "Oculus Ready PC's" this year, and for those who want an upgraded computer, there will be bundles that include an Oculus Ready PC and a Rift. These will be available for pre-order in February starting at $1499. If you pre-order Rift today, you'll be able to order an Oculus Ready PC at the special bundle price, and of course, your Rift ship date won't change. Are you excited to see what Oculus Rift has to offer?